So-called 'gentrification' is on its way to parts of north Kent that are being packaged as the 'Thames Gateway'. As house prices and sky-high rents put London beyond the reach of many working class people, this scourge is making its way along the commuter lines looking for attractive locations to prey upon. Its latest target is Strood, part of the Medway Towns, where plans to build a multi-million pound riverside development threaten to push aside the residents of Kingswear Gardens, currently sitting on this prime site. Up to 80 social tenants could lose their homes if the plans go ahead. Rachel Tree who lives with her ten-year-old son on the estate said: "We came here for a fresh start after 18-months in temporary accommodation. It's a good area and my son goes to a local special school. I'll be devastated if we are forced to move." 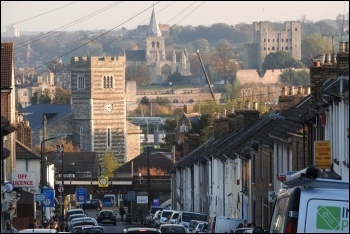 Tenants are angry that Orbit and Moat housing associations, who own most of the properties, refused to attend the consultation events in Strood, leaving Medway council officials shrugging their shoulders. "I feel they are just passing the buck" said Rachel. "There is a huge housing crisis and we need to know what will happen to us." Fear and uncertainty now affects the community, which includes a number of homeowners who are unable to sell their properties. The newly formed Kingswear Action Group has pledged to resist this latest round of social cleansing.